Videos and songs to teach Kindergarten kids about the comparison - More, Less or Equal. I can say which group has more by matching or counting the number of objects in both groups. I can say which group has less by matching or counting the number of objects in both groups. I can say when groups are equal by matching or counting. The following worksheet teaches the concepts of more, less and equal to kindergarten kids. Scroll down the page for more examples and solutions. How to compare the number of objects in one group to the number of objects in another group. We can compare in three ways: More than, Less than, Equal. Greater Than, Less Than Lesson. Use one-to-one correspondence (matching) to compare two groups and identify which group has less. 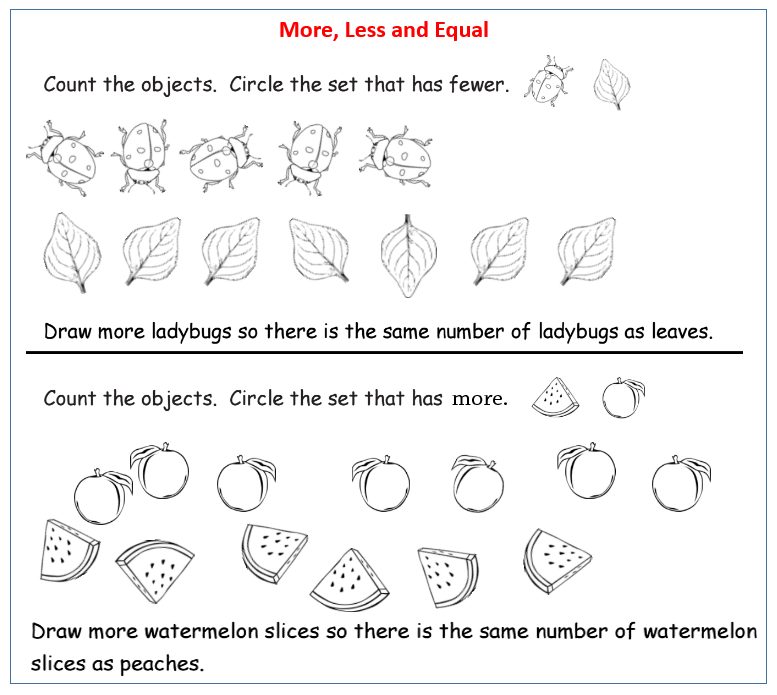 Identify whether the number of objects in one group is greater than, less than or equal to the number of objects in another group, e.g., by using matching and counting strategies. Bert & Ernie – More or Less.